Dr. Bob Moorehead’s essay The Paradox of Our Age has been quoted countless times and attributed to several others as their original quotes. I think maybe because it is so universally true, no matter who you talk to, that our society has become the very thing he describes in his essay. Take a moment and read this and see what you think. We’ve been all the way to the moon and back, but have trouble crossing the street to meet the new neighbor. We’ve conquered outer space, but not inner space; we’ve done larger things, but not better things; we’ve cleaned up the air, but polluted the soul; we’ve split the atom, but not our prejudice; we write more, but learn less; plan more, but accomplish less. We make faster planes, but have longer lines; we learned to rush, but not to wait; we have more weapons, but less peace; higher incomes, but lower morals; more parties, but less fun; more food, but less appeasement; more acquaintances, but fewer friends; more effort, but less success. We build more computers to hold more information, to produce more copies than ever, but have less communication; drive smaller cars that have bigger problems; build larger factories that produce less. We’ve become long on quantity, but short on quality. These are the times of fast foods and slow digestion; tall men, but short character; steep in profits, but shallow relationships. These are times of world peace, but domestic warfare; more leisure and less fun; higher postage, but slower mail; more kinds of food, but less nutrition. These are days of two incomes, but more divorces; these are times of fancier houses, but broken homes. These are days of quick trips, disposable diapers, cartridge living, throwaway morality, one-night stands, overweight bodies and pills that do everything from cheer, to prevent, quiet or kill. It is a time when there is much in the show window and nothing in the stock room. Indeed, these are the times! 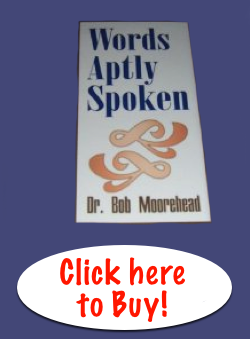 About the Author: Dr. Bob Moorehead is a former pastor of Seattle’s Overlake Christian Church. This essay appeared under the title “The Paradox of Our Age” in Words Aptly Spoken, Dr. Moorehead’s 1995 collection of prayers, homilies, and monologues used in his sermons and radio broadcasts.